My phone buzzed with a Saturday afternoon text. Paula was seeking advice on a cross country flight she was planning with her husband for Sunday morning. It would be Steve's first flight of any significant distance to breakfast and she wanted it to be a good experience for him. 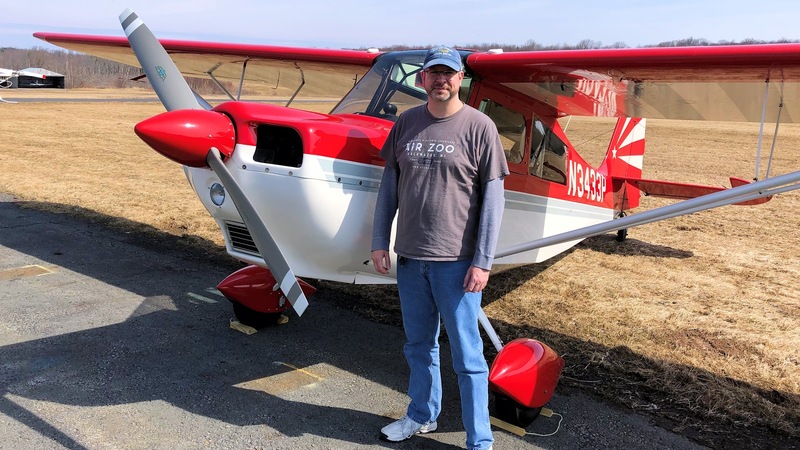 Somehow, that text evolved into a change in breakfast venue (from St Marys, PA to Cherry Ridge, PA) and several other pilots and aircraft joining in. Fortunately, Paula was pleased with the way I hijacked her trip. 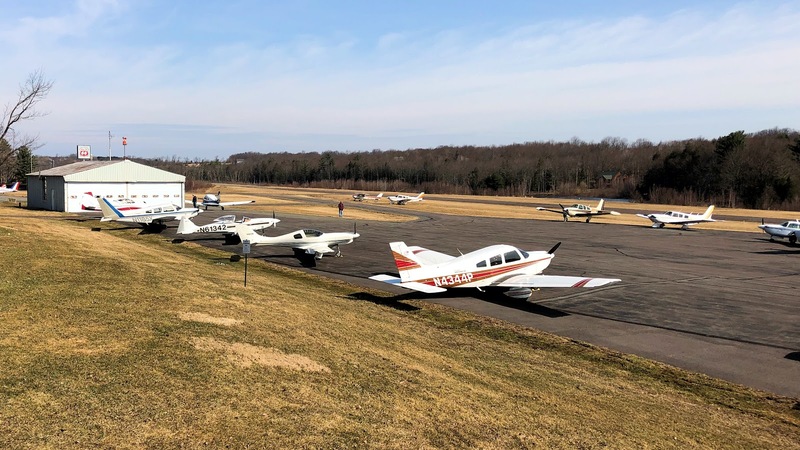 "We Ran into Some Old Friends"
Fifteen miles from the Cherry Ridge Airport, I cancelled flight following and switched to the airport's UNICOM frequency. Ahead of me, I heard Ed call out his intentions to land. Immediately thereafter, a GP4 and a Lancair announced five miles west of Cherry Ridge and inbound for landing. GP4s are relatively rare and it is my understanding that there are only about twenty-five of them in existence. 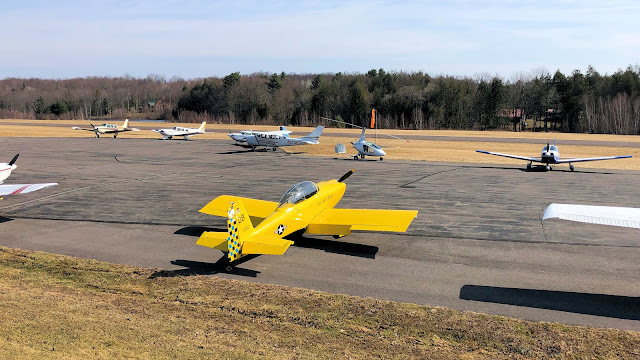 Hearing the GP4 and the Lancair bearing down on the airport, I made a mental connection. "These are the same guys we ran into at St Marys last fall." I recounted to my passengers -- Scott and Kim -- the story of how the Williamson Flying Club and a group of pilots from Bloomsburg, PA had chosen the same morning for breakfast at The West Wind last fall. We completely overflowed airport parking and created quite a challenge for the kitchen staff. I sincerely hoped that the Bloomsburg group did not have 18 airplanes with them again because parking can be tight at Cherry Ridge and the restaurant is not large. As before, the two speedy experimental aircraft plunged directly into the pattern. Ed wisely circled north of the field, then followed the faster aircraft in to land. On short final, the GP4 pilot announced that he did not have three green gear lights and aborted his landing. The Lancair went around with him. Ed landed. 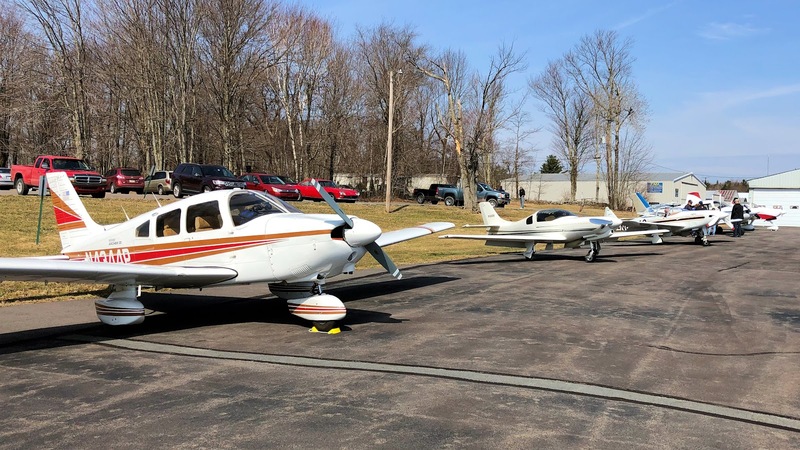 After some troubleshooting, the GP4 and the Lancair came back around for landing and I entered the pattern behind them. Cherry Ridge can be trickier to manage than one might register at a first glance of the chart. The runway is nearly 3,000 feet long, which is not short by any means. However, it lies across a north-south oriented ridge and crosswinds can be challenging. There are also significant displaced thresholds on each end, meaning that the landing distance is much less than 3,000 feet. I pulled the power on final, glided in, and made the only midfield taxiway turnoff. There was plenty of parking available on the ramp, but more traffic was inbound behind me, including Paula in Eight Five X-Ray and Mick in his Cessna 152. Mick's Cessna 152 II, which gave Warrior 481 a run for her money in terms of climb rate and cruise speed. I maneuvered close to a parking spot on the sloping parking apron, held the brakes, cut the engine, and asked Scott to climb out with the wheel chocks (always bring your wheel chocks to Cherry Ridge). As I relaxed pressure on the brakes, the Warrior rolled backward toward the edge of the pavement. While making small course corrections with the rudder pedals, I backed an airplane into a parking spot for the first time. Satisfied that I was well-positioned, I engaged the brakes again and asked Scott to chock the nosegear. It was a team effort, but we were down and parked. An RV (foreground, yellow) and gyrocopter (in front of the windsock) from the Bloomsburg group. As I disembarked from the Warrior, Ed called out good-naturedly from across the ramp. "When did you have reverse installed?" Ed, Alan, Scott, Kim and I made our way to the Cherry Ridge Airport Restaurant and put our names on the list for a table seating eleven. As we waited for a table, I chatted with the GP4 pilot whom I had met previously, briefly, at St Marys. This time, we exchanged names and phone numbers. 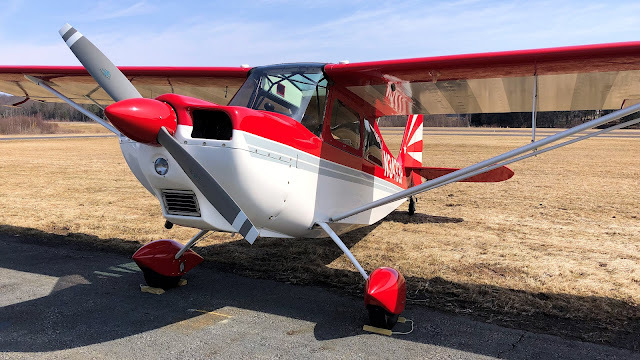 I invited them to the Williamson Sodus Airport for our scheduled Saturday lunches and they invited us to the Benton Airport fall fly-in that takes place at a private grass field east of Williamsport, PA. 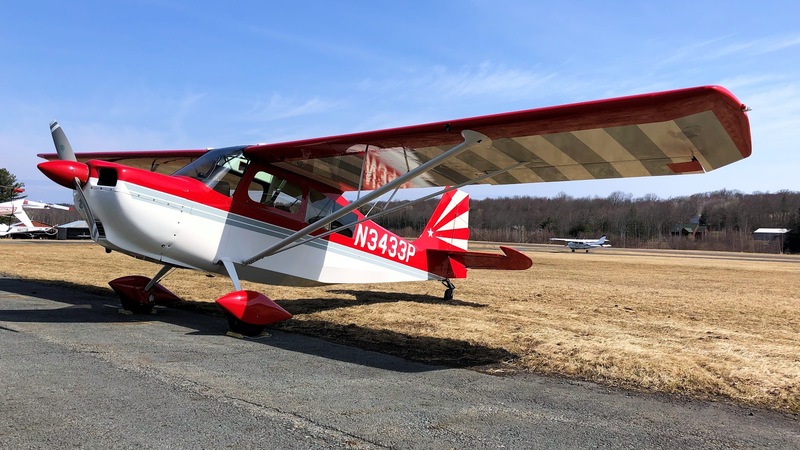 It was another new connection between the Williamson Flying Club and the broader Northeast flying community. Through the cafe window, I saw Paula in Eight Five X-Ray skimming low over the runway with flaps extended, but already halfway down the runway and too fast to land. Conversation between the Sodus and Bloomsburg pilots stopped while all eyes followed the Archer's trajectory. 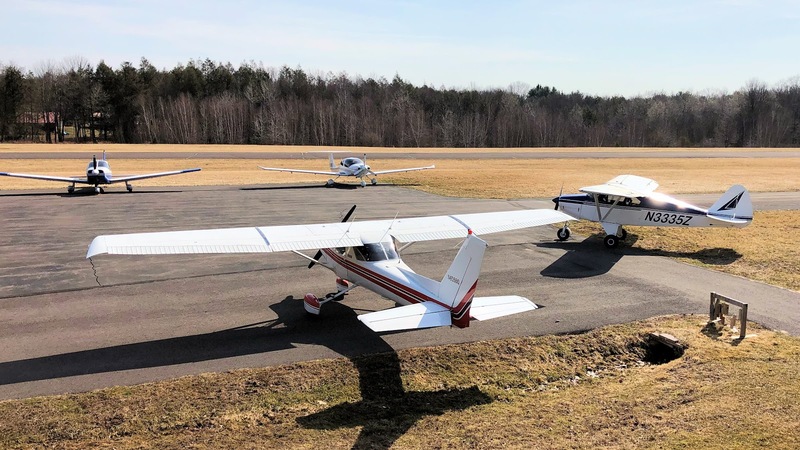 When the power came back in and the airplane pitched into a climb attitude, pilots from both groups nodded with satisfaction. Paula made a great decision to abort the landing. Members of the Williamson Flying Club at Cherry Ridge. Photo by Steve. Before long, we had eleven Williamson Flying Club members seated at a table and more connections were made. Because not everyone from the WFC knew everyone else, names and cell phone numbers were exchanged as our club tightened its own internal connections. Mark in 33P and Dave in 68W off Warrior 481's wing over South Haven, MI on July 30, 2005. Photo by Jonathon W.
As we waited, I saw a flash of red and white through the restaurant windows as a Citabria settled to the runway. It was Mark in Three Three Papa. 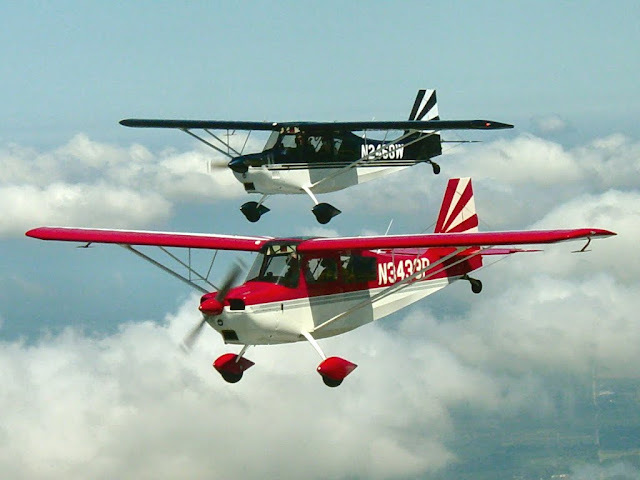 Three Three Papa was, of course, the aircraft in which I had my first general aviation flight nineteen years ago out of Dowagiac, MI. Like me, Mark was mentored by Dave. When Dave traded up to a Super Decathlon, Mark bought the Citabria and took her back to New Jersey. Coincidentally, Mark and I have similar academic backgrounds and at least one of Mark's research papers is cited in my dissertation. We had been trying to reconnect for months. Mark led his fellow pilots from South Jersey Regional, all of them wearing Alton Bay Ice Runway caps like mine, to our table and a new round of introductions were made. Later, I was able to spend a few minutes catching up with Mark to hear about his experiences with the ongoing consolidation that plagues our industry. Seeing Three Three Papa again transported me back in time to when this whole adventure first began, the summer evening in 2000 when I flew an airplane for the first time. 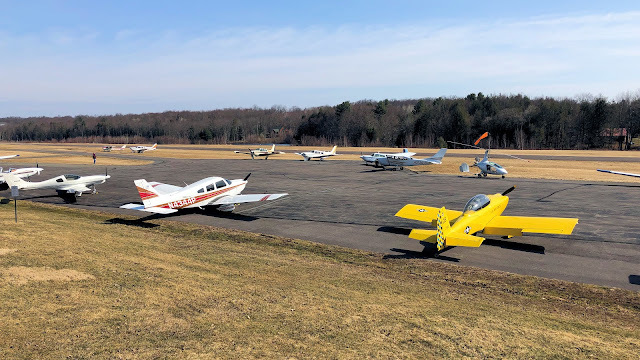 That grass runway in Dowagiac, Michigan seemed very far away from Cherry Ridge, Pennsylvania in both time and space. As I enjoyed my excellent breakfast, sunlight illuminated Cherry Ridge with a warm glow. It was the first truly balmy spring day of the year. I felt the individual elements of the day click together into a perfect morning. It was a great meal with great people. With a little prodding from me, it became an envelope stretching experience for Paula, who had never been to Cherry Ridge before and had to work a little to manage the new runway environment. It was a thrilling experience for Steve, for whom the entire $100 hamburger (or omelet, in my case) concept was new. But for me, it was the connections made that morning -- within the WFC, with the Bloomsburg group, and with Mark and my own aeronautical past -- that made for such a memorable day. And to think...it all started with a text. Where it all began 19 years ago. You'd think I would look happier. Photo by Ed.